The Weevil puts up one final battle as we move to rescue Bryseis’ mother. Bryseis hurried upstairs with so much urgency that I half-expected the Weevil to have somehow escaped, despite looking down at his dead body. Then I remembered the banging on the closet door in the middle of the battle and suddenly felt guilty. 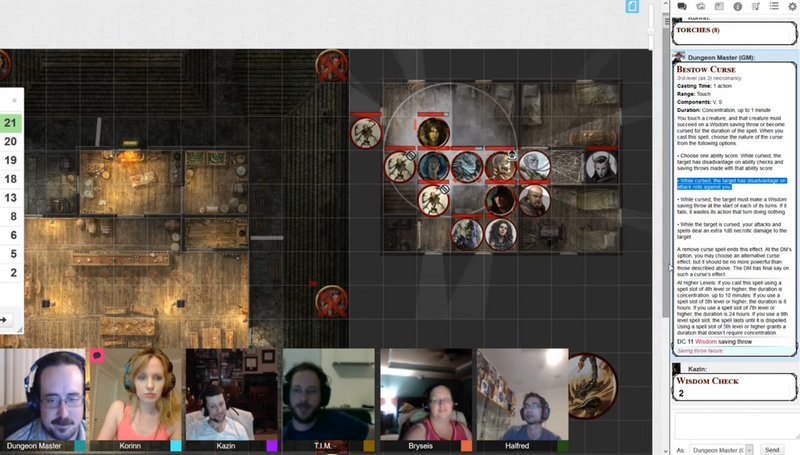 We heard some muffled voices, then a pair of tiefling women came downstairs. The other looked only slightly older than Bryseis. The family resemblance was uncanny. Bryseis glowered and pointed a finger at my feet. I leapt to the side as a tiny bolt of flame scorched where my foot had been moments before. With the flawless stealthily infiltration last week, it was just a matter of taking on the Weevil and his final bodyguards, which proved a bit more difficult than we anticipated. By setting off the lightning trap to kill a guard, we’d finally announced our presence. Halfred shot a smoke arrow into the hallway along with a web, though neither seemed to affect the already extremely crowded, noisy second floor hallway of the Leaky Barrel Inn. 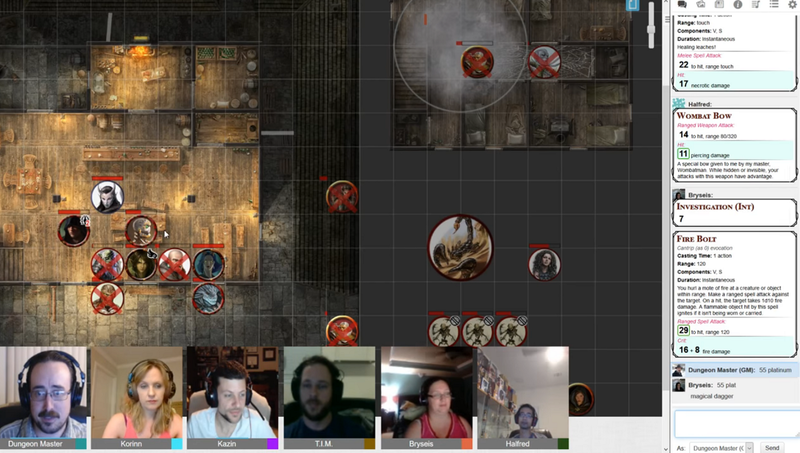 Aside from the sneaky Weevil we had to deal with a tentacled Kraken Priest, none too happy about our near-destruction of the Kraken Spawn, and two newcomers, an orc necromancer and a human bard. We still had the numbers and most of our spell slots, but the Weevil had a nasty trick up his sleeve, an orb he threw into the hallway as we came up the stairs. The mist left an an Antimagic Field, nullifying not only our magic, but also our magical items. It was hilariously stymieing as we suddenly realized how much our various powers derived from magic. Thankfully there was a bit of friendly fire involved, as the field also dissipated the necromancer’s newly summoned skeletons. T.I.M. held his ground against the Kraken Priest’s fearful screams, while Kazin charged into the southern room and shoved the bard into a corner, narrowly escaping the Antimagic Field as he began laying into the necromancer. The sorcerers followed suit, running further into the hallway to escape the magic dampening field and turning their attention on our primary foe. The Weevil was a high level rogue, and very annoying to hit with both attacks and AOE spells, using Evasion and Uncanny Dodge. He got a nasty 40+ hit on T.I.M. using his Dagger of Venom, partially due to T.I.M.’s vulnerability to piercing damage from his Flux Plate armor. The tides began to turn in our favor, and our foes began escaping – right out of the windows! Halfred was the first to pursue, finding the necromancer enlarging a scorpion from a glass jar back in the Inn lobby, and firing a flashing arrow into his face. Kazin leapt down the single story and charged, killing the necromancer and reversing the scorpion spell. The others chased after the Weevil. Bryseis yearned to kill her hated Zhentarim foe, unleashing a Fireball into the middle of the room. She used Careful Spell to take a bit of the sting off of Halfred and Kazin’s collateral damage. It was T.I.M. who would finally kill him with his spectral leeches (Inflict Wounds), eating out the man’s eyeballs. Yeeeeech! The bard was in full flight mode. Kazin demanded her tambourine, which he destroyed, then let her go. Kazin is two-for-two on dramatically destroying magic items, whoops. We’d head the closet door bang around a bit during our upstairs battle. Bryseis ran up to find her captive mother, Leandra, bound and gagged but otherwise in good spirits. She was more slightly annoyed than anything else, but grateful for the rescue. 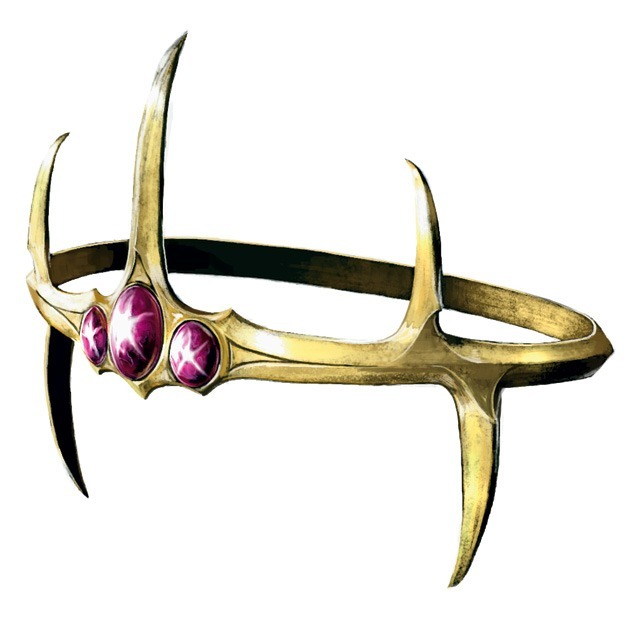 Leandra pointed out a special Diadem that she had made for Bryseis that the Weevil had stolen, and we plucked it off his body, along with his dagger. The Diadem would change how her Wild Magic Surges worked, making it a flat 10% chance after every spellcast, but she could choose within two numbers from that crazy d100 Wild Magic Surge table. I pointed out the Wanted Poster from Mirabar that rewarded a cool 5,000 gold for his delivery, dead or alive. The tiefling woman agreed to take a side trip to deliver the body for a cut of the profits. With our share we could probably retire after all this is done! Bryseis gave most of the rest of her money to her mother and told her to expand the family gambling business into Waterdeep. We bid farewell to Leandra as we still had the looming threat of the blue dragon and the Giant Ordning to take care of. After a Long Rest at a more reputable Inn, we gathered around the conch shell we had taken from the Cloud Giants, and transported into the underwater headquarters of the Storm Giants to rescue a princess, defeat a blue dragon, and save the world.